With Mario Tennis Aces' release just around the corner, Nintendo is giving fans the chance to try out the game in a pre-launch online tournament. In case you'd forgotten, or in case you hadn't heard about the event at all, here's a friendly reminder to show you when you can start playing. For European players, the event gets underway today (1st June) at 3pm BST, ending on Sunday 3rd June at 11:59pm BST. For players in North America, the tournament starts today (1st June) at 6pm PDT / 9pm EDT, ending at 11:59pm PDT Sunday 3rd June. Remember, you'll be able to choose from Mario, Bowser, Peach, or Yoshi, and can challenge the "online tournament" as many times as you like. More characters will unlock as you play, and you'll be able to get your hands on the 'Overalls Mario' costume for use in the full game if you take part. The software can already be downloaded directly from the Switch eShop. Will you be jumping onto the courts? Let us know if you'll be serving up a few games in the comments below. I have never been so hyped for a silly demo. I love a quality Mario sports title and I hope tonight will prove that all the glowing previews I've read were correct. I’m loving it so far. It’s super. Lost a lot of matches as that trick shot is hard to master but pleasing when it’s pulled off. Lots of feature shots. Lots of characters. @JHDK I've never been hyped for a Mario Sports title before, but I really, really want this to be good. Since Virtua Tennis is apparently dead, and tennis games in general seem to be a thing of the ancient past (I guess, because they translate pretty well to games, even to motion controls hint VR hint, there is really not point in making them anymore ...), this seems like the last chance for a good long while to replace VT3. I'll miss tonight as I'm US, and I'll be sleeping before work, but I'm excited for tomorrow! Hope this lives up to the hype. Downloading the Japanese version now which I'm assuming has already started. @1UP_MARIO "I’m loving it so far. It’s super." Where are you if I may ask? Your profile says UK but I don't think the UK gets it for another hour after you posted. We dont' get it until 9PM, so for us it's less "today", more "tonight". Gonna jump on with my son in 5 minutes to see what the game is like. If we both like it, will pre-order. @1UP_MARIO Thanks. Are you actually taking place in online tournaments in Japan w/ that account? Thats' impressive if their online is working that well. I never did set up any extra accounts on our Switch, PS4 has US, Hong Kong, Japan and UK but I set those about years ago when those accounts were all getting a different demo or PS3 theme each week. Rarely touch them any more so I didn't see the need on Switch to go through the trouble. @rjejr it works really well, I downloaded from the jap eshop but was playing with my uk account. I wanted to play it early as with the uk time I was middle of work. @1UP_MARIO Thanks. Maybe I should go make a UK account and start playing now. Cool, I’ll jump in tonight after work. Wow, 9pm on the east coast? Might as well just start in on the 2nd. Wow! This game plays extremely well. Definitely gonna pre-order. Again, my maxim of give me a decent Demo and I will buy the game. Does anyone know yet what the prize is for winning a tournament? Definitely going to try this out, I'm really happy they are doing a demo since I'm still on the fence about the game. The gameplay's very solid - lots of new stuff to learn. I was really enjoying it until I went online and got battered, I didn't feel I had a hope and it put me right off. I'll always prefer offline single player gaming as that's what I grew up with. I'll be on this Sunday. I work doubles fri and Sat sadly. Why is it always either tennis or golf that nintendo link with Mario? If they're going to attach their mascot in tenuous ways to sports, they could at least show a bit more imagination. After all, In most other areas nintendo has never been short of that. I wanted to play in casual mode using the gesture controls (like Wii Sports) but that doesn't seem enabled for the demo. That's the make or break test that means pre-order or ignoring for me. @Kirby-in-Kirkby ...what sports do you want, then? He's done kart racing, basketball, football/soccer, baseball.. what else is there? Top tip: You can see the strength of someone's internet connection when deciding to challenge them. If it's too low for your liking (1 or 2 bars) you can decline the match and look for another opponent. @Mew Cricket! or Bowling...actually I'd buy Mario Bowling. Hockey too. @ralek85 - not really ancient past. There are two mainstream tennis releases due this year. I have been playing for 4 hours now and I think it is the best entry in the series. Heaps of fun! I have already won 4 online tournaments and accumulated ~6000 points online. Especially close matches are really thrilling! Can you play online with friends in the demo? I'm getting to the semi's at best then bring annihilated. I'll be miffed if come Monday I've not won one Grand Slam. You live in UK, right ? Well.... i need a guide for setting my e-shop account when i get European New 3DS machines to play PAL region 3DS games. And for your Japanese e-shop account on Switch, what setting did you put ? So, the demo of USA version is already out now ? @Mew I'd forgot about the football one and didn't know he was in baseball and basketball titles. I wouldn't really call Mario Kart a sports game though, racing has traditionally been considered its own genre. Anyway, I still stand by my original point, there are dozens of sports still to explore while the same few favourites seem to be returned to over and ever. @norwichred Are you talking about Tennis Tour though? That's out already and I cannot for the life of me recommend it. It's kinda a mess to say the least, and it might as well not exist. Argh, I was beaten twice due to terrible lag, I’ll try again later! @Anti-Matter best to make a japan switch account. Japan always has most games and demos first. I mean, what city you set when you make Japanese e-shop account ? Tokyo or Osaka or something else ? And what about your European e-shop account ? I guess you set UK, (city name). I have a plan to buy Japanese / European 3DS machine so i need to know what is the best city should i choose when i set the hometown for e-shop account. @Anti-Matter For the switch account you don’t need the city I just put japan. So far it is very fun. But I mostly played against the CPU because in the online matches I had a lot of lag. I the game has substantial singleplayer content I will probably buy it. It's pretty cool though if I buy it I think I'll be sticking to the classic mode. Too many times I would run instead of doing a zone shot & if I got the zone off I'd hit the net way too often. That & I noticed I score more using regular shots than anything else while my opponent had to rely on that meter. I had issues with the lag too and it's just this game, trust me. I am going to play a match or two just to get the Mario costume, then probably just do some CPU training to get a feel for the game. I really don't care for competitive gaming. @DockEllisD They need to bring back Mario Baseball. 95% of my friends list are playing this demo right now. I suspect that could have a bit to do with the lag that I have experienced. The practice mode though works fine, and I will probably play this more offline than on. I'm already enjoying it more than Ultra Smash. @grougrou It runs perfect for me until the final and then when I’m so close to a victory the speed drops and I’m worthless on the court. @Riderkicker I had the same issue, but once I got used to it the matches became like Dragon Ball Z fights and it was pretty fun trying to counter my opponent and sometime I hung on by the skin of my teeth by KOing them. I've had fun with this game so far, but both of my online matches suffered from occasional lag that caused me to miss returning the ball to the other player. 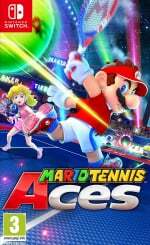 Nonetheless, the polish and fun that Camelot was known for regarding Mario sports games appears to all be present in their latest tennis offering. Out of my 4500 gold coins that I had accumulated, I just used 3000 to pre-purchase this game for only $29.99. It turns out Wario was on to something when he went all in on gathering as many gold coins as possible - they come in handy! I can't find the Demo from E-shop. Should i have to click the Pre-Purchase button first & register ? My account is USA region. And one thing, i will buy the game in Physical retail so i don't want to double dip the same game from e-shop. @Anti-Matter Go to the news section and click on the Mario Tennis pre-purchase news story. On the top right of the screen, there should be an icon for downloading the demo. Played a little bit this morning and have to say I am very impressed. Must buy for me Had to laugh at Yoshi when I got him to taunt the opponent. For some reason I just wanted to keep looking at that huge replay screen on the court that shows the match for the people who are in the game, looks beautiful. Gave it a quick go and surprise how much I enjoyed it. Definitely a “easy to play/hard to master” type game. @stuie1234 No worries man, I got battered myself when I started playing online and lost my first 5 games in a row. Then I went on a winning streak and just now got to the final match in a tournament, but lost it. The game is full of strategy, and playing more and more online shows you the different types of shots that are better in certain situations, and you also start to learn how to fake-out the other player and make them think you are about to do something that you are not actually about to do. Try playing with different characters too. I got destroyed as Mario, but started obliterating my opponents as Peach. Okay played it again this morning and had a much better time then last night. Can't wait for the full game. This game is a lot more complex than I thought. Got wrecked hard at the beginning, but eventually got the hang of things. It's a great game. obviously the more bars a person has the less laggy the game will be, but there's definitely more satisfaction to be garnered by winning with regular tennis shots rather than the fancy tricks, I'd very much like to play the game in pure tennis mode. @1UP_MARIO Not entirely true... Just check the number of games available and you’ll notice that in Japan we’re over 200 games short when compared with the US (most of them indies, but still...) Also there are games like ARMS or Kirby with demos in the US but not in Japan. Just finished playing the demo. I liked it quite a bit, the zone shots and quick shots are cool to do, and boy, does it feel good when I do a special shot and I break my opponent's racquet. The only bad part is, of course, the input lag when there's a poor connection and that really screwed up my game at times. Other than that, it was fun while it lasted - I think MTA is one of the better Mario sports games in recent years. @maruse You would have to accumulate a set number of points to unlock Waluigi and other unlockable characters. The game is really fun but man are there some good players out there already and the system does not match points/time played as it should do. This means you come along having played three games and get pitted against someome who has 3000 point score meaning they've been playing for the last eight hours straight. @Ryu_Niiyama There's not a lot to go on from with JUST bowling, is there? @MarioLover92 Oh, I see... I didn't know that. I haven't played the demo enough to accumulate any significant amount of points so I wasn't aware you could unlock more characters. Nice to know it wasn't a cheater.